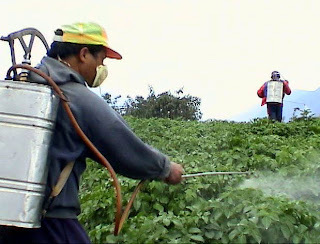 "I visited an industrialized potato farm in Idaho and saw how freely pesticides were used. The farmers had little patches of potatoes by their houses that were organic. They couldn't eat their field potatoes out of the ground because they had so many systemic pesticides. They had to be stored for six months to off-gas the toxins." "An "organic feedlot" should be a contradiction in terms, but it's not under the rules." Potatoes ....one of the dirty dozen. Buying organic can be such an illusion. Correction, it's 15th on the revised list. That's a great list. Kale, lettuce, collards, spinach ... all the greens are high. what are the other choices than farming your own.